THIS BOOK, prepared as in included "Two volumes in ONE BOOK (Contains Vol. I & II) and Unabridged Translation" by James Murphy. 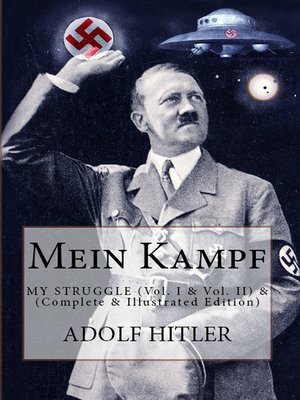 And This translation of the unexpurgated edition of "MEIN KAMPF" was first published on March 21st, 1939.. AUTHOR - "ADOLF HITLER" sought Lebensraum ("living space") for the German people. His aggressive foreign policy is considered to be the primary cause of the outbreak of World War II in Europe. He directed large-scale rearmament and on 1 September 1939 invaded Poland, resulting in British and French declarations of war on Germany. In June 1941, Hitler ordered an invasion of the Soviet Union. By the end of 1941 German forces and the European Axis powers occupied most of Europe and North Africa. Failure to defeat the Soviets and the entry of the United States into the war forced Germany onto the defensive and it suffered a series of escalating defeats. In the final days of the war, during the Battle of Berlin in 1945, Hitler married his long-time lover, Eva Braun. On 30 April 1945, less than two days later, the two committed suicide to avoid capture by the Red Army, and their corpses were burned.